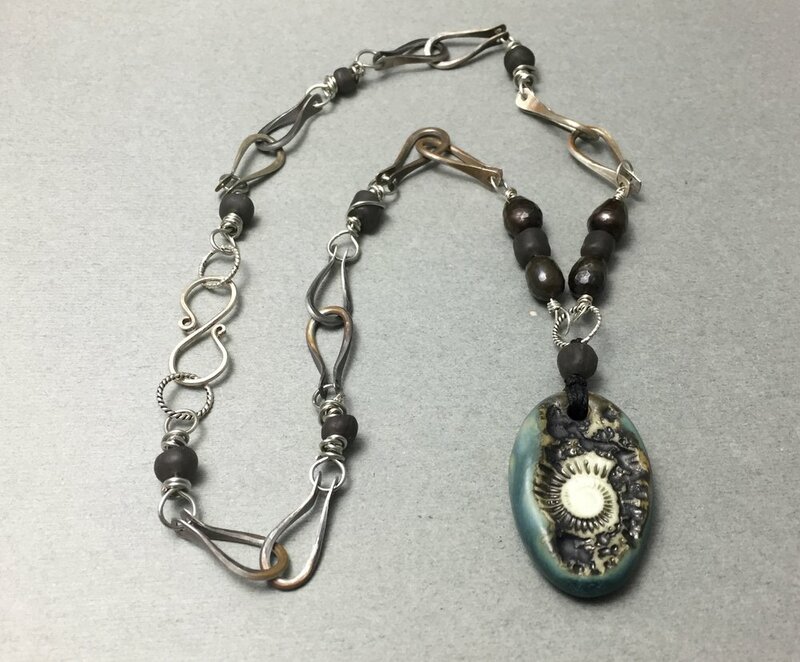 I was so fortunate to get picked for the Art Jewelry Elements July monthly challenge. Lesley Watt aka The Gossiping Goddess provided use with gorgeous ceramic pendants, you can find similar pendants in Lesley's shop THEAElements. I've been busy organizing my studio and getting rid of items I don't need. It was fun to design a new piece and I decided to use a tutorial I had sitting on my Pinterest board, which is a tutorial from Cold Feet Studio. I knew I wanted to try making this chain. So practiced on copper then on to sterling. I am happy with how it turned out. I was going to use more pearls, but I could not ream bigger holes, I need an electric bead reamer. The pearls that I loved using with it barely fit 22g wire and I was not happy with that for the entire design. I just love the pendant that came my way and was able to match some pearls and glass beads with it. I made the chain and the clasp. Trying to decide if I am going to polish it up more or leave the heat patina on it. Please check out Art Jewelry Elements and the participants below to see what everyone else created, you will find so much inspiration. Thank you Lesley and the team at Art Jewelry Elements for all the inspiration! Thanks so much for stopping by I hope everyone is enjoying some lazy days of summer.